The primary goal of the city strategy (Development Strategy for the City of Poznań 2030) is to improve quality of life for all inhabitants, in such a way that everyone feels that they have a stake in co-creating the city. One of the five strategic objectives of the city strategy – 'A green, mobile city' – sets out NBS objectives, while the other strategic objectives, including 'Friendly housing estates' and 'The spirit of community and social dialogue' contain elements of NBS. NBS objectives are also incorporated in the documents on strategy and additional spatial planning (Development Strategy for the River Warta in Poznań 2012–2030, Environmental Protection Programme for Poznań 2013-2016 looking ahead to 2020), with the aim of revitalising and protecting the green wedge areas along the Warta, Cybina and Bogdanka rivers. These objectives are intended to protect the green areas from new developments, preserve existing parks and green areas and create new parks and recreation areas. The Development Strategy for the River Warta in Poznań 2012–2030 aims to create extra space for the river Warta, deepen the Bogdanka river bed, build additional river channels and increase recreational activities on the rivers. In addition to the NBS-related objectives mentioned above, NBS are recognised as tools for contributing towards social objectives in all strategic city documents (developing environmental education, supporting and creating new open public spaces, making the city family- and senior-citizen-friendly, supporting cultural and sporting activities for social development and improving the health of residents). Poznań's green areas currently constitute around 27% of the city's area, most of which is taken up by communal forests (2 580 ha) and parks (over 526 ha). The city authorities focus on effectively managing and revitalising the green wedge system, while creating new sites in spite of the limited available space. In recent years, 18 000 trees have been planted solely alongside roads. Efforts have been made to prioritise green space over concrete areas through transitional elements, such as containers with various seasonal flowers, to improve the urban environment. Parking places in sealed areas have been transformed into green areas, e.g. the square at Poznań City Hall and at Kolegiacki Square, which has improved soil quality and climatic and water conditions. 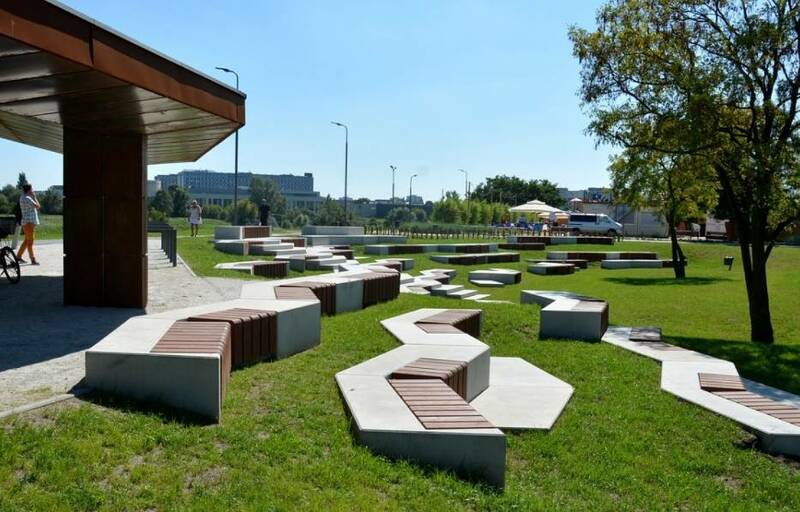 In the city centre, a new park – the Stare Koryto Warty Park – has been built on a 3.5-ha-area that previously consisted of undergrowth, which includes a playground, an exhibition space, an amphitheatre and fountains. On the Warta River, four seasonal beaches have been created where local citizens can relax in summer. Community gardens (a tradition covering 3.1% of the city) have also been set up, with the aim of maintaining resident participation. After a pilot stage to build gardens in schoolyards, the city authorities now intend to involve pensioners as well. During the programme the authorities provide inhabitants with plants and gardening tools. Furthermore, the city authorities are planning to identify more areas available for residents to develop gardens. The public bicycle system has been upgraded with new public bikes and additional cycling routes that supplement public transport, with the ultimate aim of having a complex and comprehensive cycling route system throughout the city. The main driver for implementing NBS is the need to keep residents in the city and to combat air pollution and climate change. In addition, a changing trend in the behaviour of citizens can be detected, as residents ask for more green investments to be carried out and start taking the initiative for planning and carrying out these projects themselves. This shows that when there are financial possibilities available to inhabitants (in this case under the Poznań Civic Budget), the inhabitants suggest and then choose the projects, e.g. which projects are intended to improve the city's environmental quality. Due to lack of space in the inner city, sometimes the only opportunity for greening is along the roads and streets. Here there is a conflict with underground and other infrastructure and in many cases greening is difficult. Spatial planners and designers are very interested in creating green areas in the city. In practice, however, extensive green spaces are not in the interests of developers, which often leads to a conflict between planners and investors. The key lesson here is to have more dialogue with the other responsible sectors, showcasing the multiple benefits of NBS while at the same time employing technical solutions to enable NBS. The city’s own budget provides the largest financing share for green investments, followed by the national fund for environmental protection and EU funding. Funding for maintaining and establishing green areas comes mostly from the city budget. EU funding is available for certain projects and activities e.g. EU funding is used for a current development project involving a 14-ha park and the purchase of native plants for the park. Acknowledgments: Jakub Kronenberg, Stephan Pauleit, Poznań City Hall staff.